They can't all be winners, right? Pretty Little Liars Season 5 has had pretty good run of strong installments, but sometimes an episode doesn't quite make the grade. A did put the girls in some dangerous situations in this case, or at least the one situation that actually involved A did. While Pretty Little Liars Season 5 Episode 8 provided some nice clues about the Bethany Young mystery, the season has started spinning its wheels by creating more unnecessary drama. Most of the drama involves Hanna, who continues her downward spiral. Hanna was starting to lose control last week in Pretty Little Liars Season 5 Episode 7, but now her situation is just getting annoying. She and Caleb get drunk every chance they get and she's constantly avoiding her problems instead of speaking up like she has in the past. She hates Alison, but she's not the only one with Ali issues. Why not just speak to her friends about it? Instead, her behavior is making her seem unreliable and untrustworthy to the other liars, isolating her even more. Now, I don't think it was fair of Aria to attack her after the Zack confession, but Hanna definitely set the scene for that dramatic encounter. While we're on the subject, the whole Zack-Hanna thing feels like the worst kind of plot contrivance. Zack was this amazing guy not that long ago, but now he's a super creepy?!? What is with it Rosewood and the men chasing teenage girls? Zack's abrupt shift in characterization indicates either lazy writing or another A-plot. We did just see A steaming open an invitation to the engagement party last week, so could Zack be an A minion or being blackmailed into hitting on Hanna? Alison also created some superfluous drama by having Noel Kahn break into the Marin household. She was acting very strangely, and, as PLL fans, I'm sure we all knew to be suspicious rather than concerned. So, she needed a parent on her side and thought the best way to accomplish that was with more lies? She made a good choice in parent since Momma Marin is the most protective, but Ashley's also more astute than some other clueless parents. This stunt may have helped her out with the adults, but it definitely didn't endear her to her friends. Spencer, Aria, and Emily actually spent their time doing real investigating into Mrs. Di and Bethany's deaths. Aria finds out from Rhonda that Mrs. Di and Bethany had a much more involved relationship than previously thought. Jessica DiLaurentis frequently signed Bethany out of Radley and gave her lots of presents, including a horse. Spencer and Emily's trip to the stables led them to Melissa's riding helmet, but was that just planted by A? 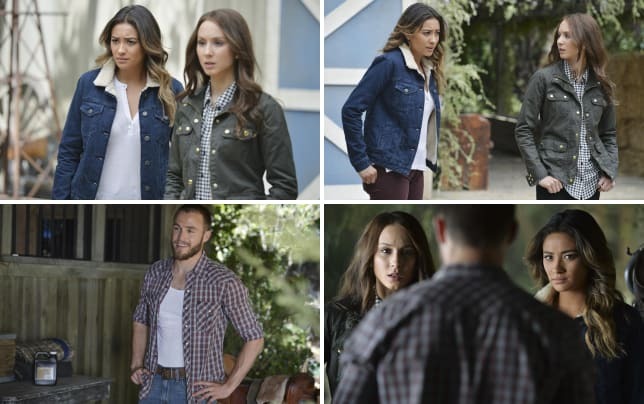 Throughout these revelations, Spencer was clearly suspicious of Alison's involvement. And after her stunt at the Marin house, the other girls are looking a little concerned as well. So, do you think Alison knew about Bethany? Of course she did. Probably not. She knew something, but nothing definite. Let's take a look at Pretty Little Liars music from the episode, shall we?